Dive into a paw-some adventure about dogs on the job in the first installment of the Pets At Work (PAW) series! Meg Harper has moved more times than she can count, and this year is no different. She’s tired of being the new kid, and because of her epilepsy, she’s tired of being the sick kid. 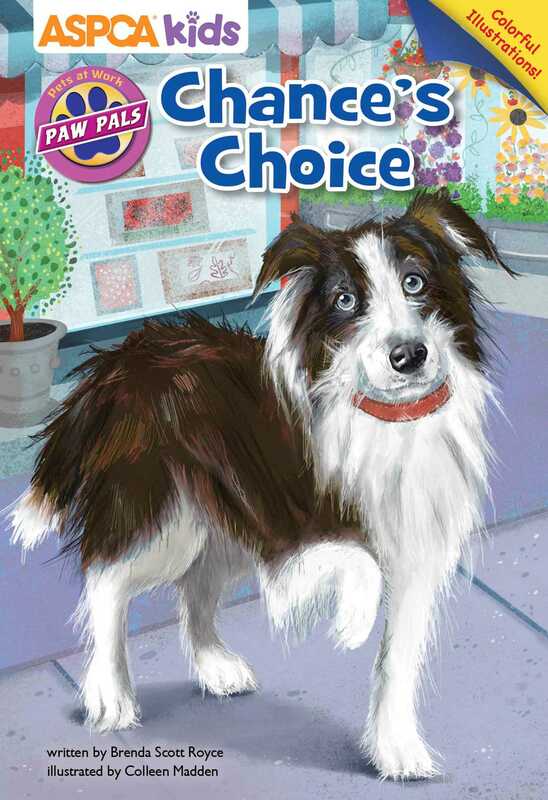 When a scruffy dog is abandoned at her uncle’s pet grooming salon, Meg and her cousin, Amanda, vow to work with their local shelter to find the collie a good home, giving him a second chance. But when “Chance” comes to Meg’s rescue when she experiences a seizure, Meg wonders if he could become an assistance dog—a Pet At Work—the question is...for whom? Find out who saves who in this illustrated chapter book about amazing animals! Brenda Scott Royce is a lifelong lover of beasts and books—and whenever possible her work combines the two. She’s served as editor of Zoo View, the award-winning magazine of the Los Angeles Zoo, for more than a decade. Her children’s books include two titles in the ASPCA’s Pet Rescue Club series— Champion’s New Shoes and Bailey the Wonder Dog. Her award-winning comedic novels Monkey Love and Monkey Star chronicle the misadventures of Holly Heckerling, a stand-up comedienne who befriends a monkey while juggling career and romantic entanglements. Brenda likes to say that she majored in monkeys in college (she earned a bachelor’s degree in primatology and anthropology from California State University, Fullerton) and that some of her best friends are chimpanzees (she worked as a chimp keeper at a wildlife sanctuary). She lives in Glendora, California. The fourth girl in a family of eight children, Colleen Madden made it through childhood pretending to be a space princess with a wookie sidekick and drawing in her cardboard box art studio. Colleen spent some time acting and training at The Second City in Chicago, and then went on to graduate from a small liberal arts school in Massachusetts, with a major in illustration and English literature. She currently resides in the Philadelphia area with her writer-husband and their two sons. She has illustrated for many different kinds of clients and is the recipient of an International Greeting Card Louie Award. When not illustrating, Colleen can be found long-distance running, making her boys giggle, and eating lots and lots of sushi.